Here I am reading The Great Gatsby Anthology in front of the majestic and venerable Bedford Oak. This emblem of our village (Bedford, New York) is estimated to be more than 500 years old. 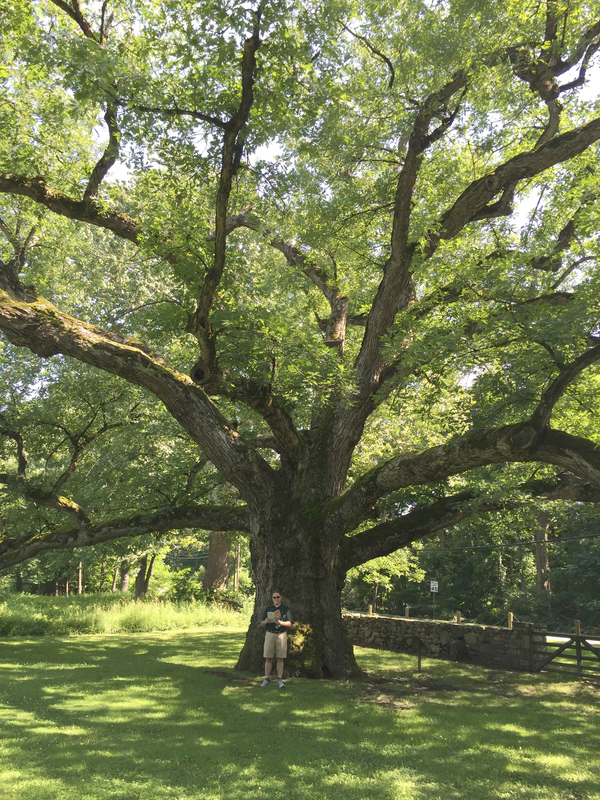 This incredible white oak stands with a girth of more than 23 feet, with a spread of branches that goes out to some 130 feet. Unfortunately, the photo doesn’t capture the whole of it. This tree was growing when Native Americans populated the area, it stood strong through local events in the Revolutionary War, and most certainly was thriving when Fitzgerald was penning The Great Gatsby in the early 1920s. ABOUT THE AUTHOR: Gary Glauber is a poet, fiction writer, and teacher. In April 2015, he took part in Found Poetry Review’s PoMoSco project. Recent poems are published or forthcoming in Blue Heron Review, Pilgrimage Magazine, West Trade Review, Calliope Magazine, The Bookends Review, Deep Water Literary Journal, Typoetic.us, The Legendary, Xanadu, and Think Journal. His first collection, Small Consolations, was published in July 2015 by The Aldrich Press. A chapbook entitled Memory Marries Desire will be available from Finishing Line Press in fall 2015. He contributed his poem about Nick Carraway, “I am not even faintly like a rose,” to The Great Gatsby Anthology. AUTHOR’S NOTE ON THE PHOTOGRAPH: This is Confucius, not the man with the red shirt and glasses, but the eroded one in the back. The man with the red shirt and glasses is the poet Shahé Mankerian whose poem “Hallowed Books” appears in that golden anthology about Gatsby. The photograph is taken at California State University, Los Angeles. The quote on the statue reads: “Among truly educated persons there is no discrimination.” In a strange way, the quote reminds me of the exchange between Jordan and Tom. ABOUT THE AUTHOR: Shahé Mankerian‘s manuscript, History of Forgetfulness, has been a finalist at four prestigious competitions: the 2013 Crab Orchard Series in Poetry Open Competition, the 2013 Bibby First Book Competition, the Quercus Review Press, Fall Poetry Book Award (2013), and the 2014 White Pine Press Poetry Prize. 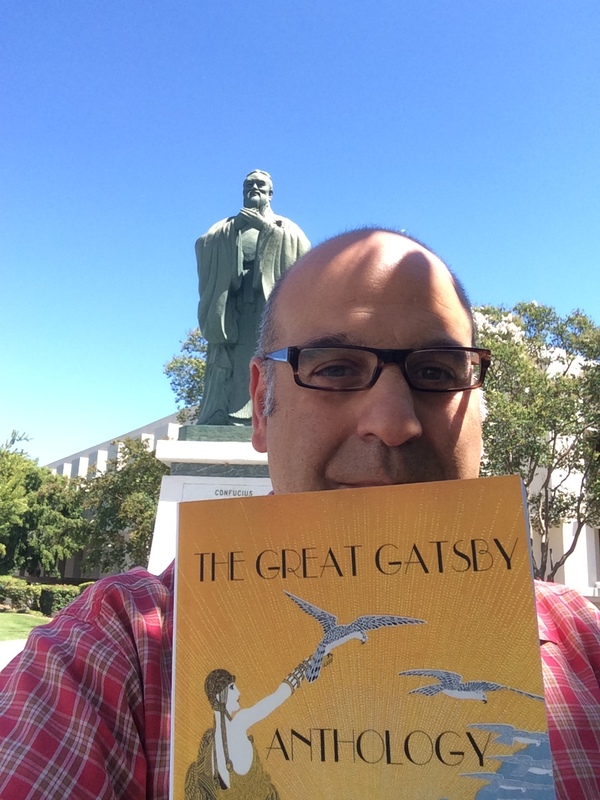 Shahé serves as the principal of St. Gregory Hovsepian School in Pasadena and co-directs the Los Angeles Writing Project. He has been honored with the Los Angeles Music Center’s BRAVO Award, which recognizes teachers for innovation and excellence in arts education. 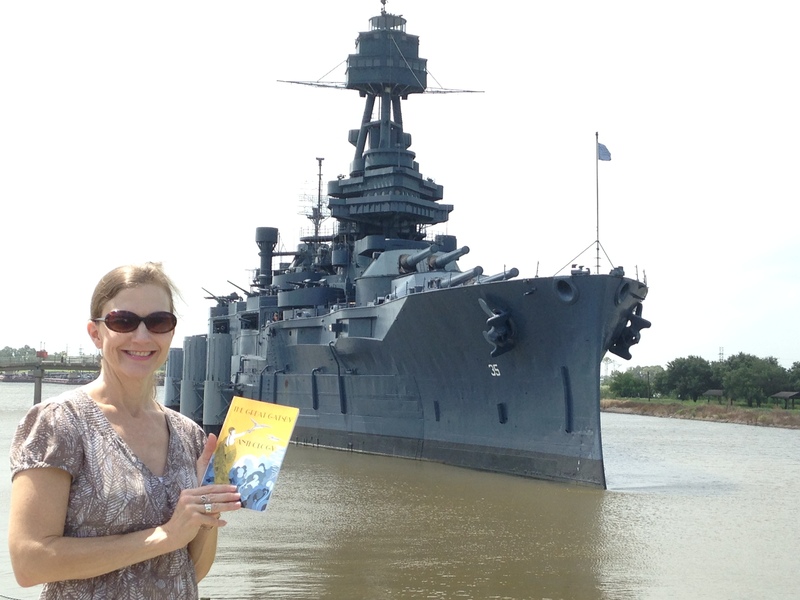 PHOTO: Poet Laurie Kolp with her copy of The Great Gatsby Anthology before the Battleship Texas (LaPorte, Texas). Laurie contributed her poem “Tea with a Tiger” to the collection. The Great Gatsby was her mother’s favorite book of all time, and will always hold a special place in Laurie’s heart. ABOUT THE AUTHOR: Laurie Kolp serves as president of Texas Gulf Coast Writers, and each month gathers with local members of the Poetry Society of Texas. Laurie’s poems have appeared in numerous print and online journals worldwide, including the 2015 Poet’s Market, Scissors & Spackle, North Dakota Quarterly, Blue Fifth Review, and Pirene’s Fountain. Laurie’s full-length poetry collection, Upon the Blue Couch (Winter Goose Publishing, 2014), is available on Amazon and Barnes&Noble. Her chapbook, Hello it’s Your Mother (Finishing Line Press) is now available for preorder here, and is set for publication October 2015. Visit her at her website, on Facebook, and Twitter. 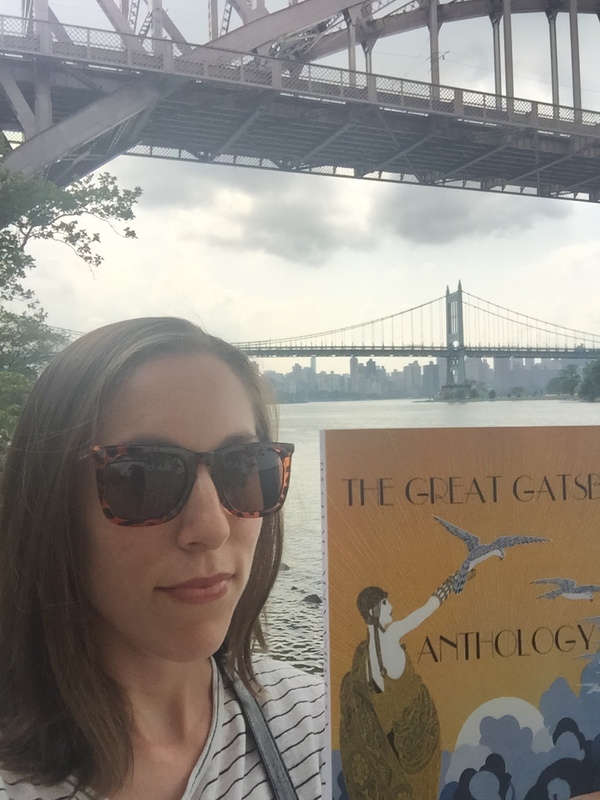 PHOTO: Poet Rachel Voss with her copy of The Great Gatsby Anthology in Astoria Park (Queens, New York) overlooking the East River/Triboro and Hell Gate bridges (not quite the Valley of Ashes and the Queensboro Bridge that Fitzgerald wrote about in The Great Gatsby — but not far). ABOUT THE AUTHOR: Rachel Voss is a high school English teacher and lives in Queens, New York. She graduated with a degree in creative writing and literature from SUNY Purchase College. Her work has appeared in Hanging Loose Magazine, WORK, Blast Furnace, The New Verse News, Newtown Literary, and Unsplendid, among others. She contributed her poem “Villanelle on a line from The Great Gatsby” to The Great Gatsby Anthology. 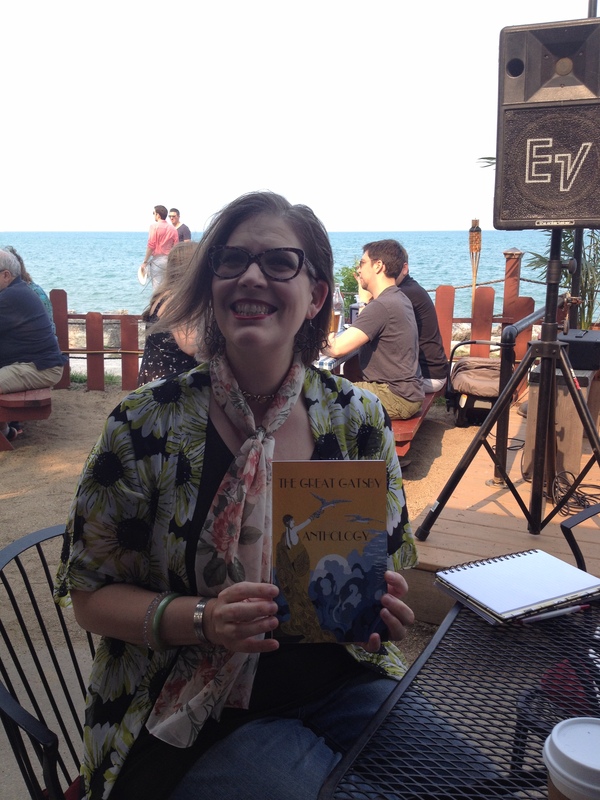 PHOTO: Jennifer Finstrom reading The Great Gatsby Anthology while enjoying a view of Lake Michigan in her Chicago neighborhood, Edgewater. 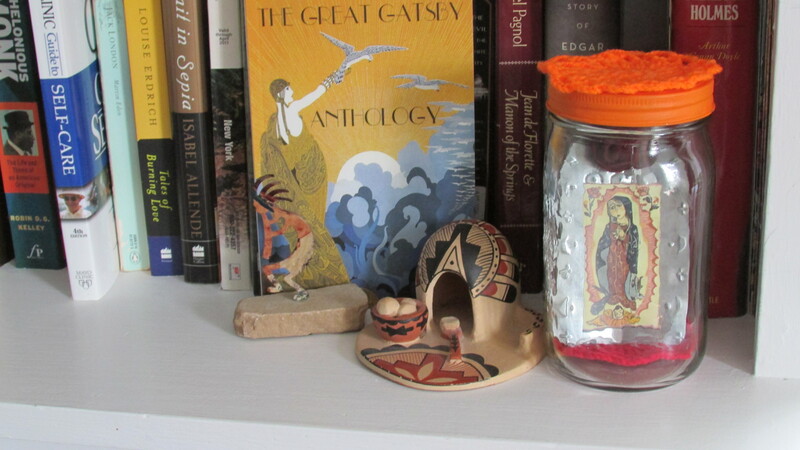 Jennifer contributed her poem “Almost Sonnet Written While Thinking About First Love, Greek Mythology, and The Great Gatsby” to the collection. ABOUT THE AUTHOR: Jennifer Finstrom teaches in the First-Year Writing Program, tutors in writing, and facilitates a writing group, Writers Guild, at DePaul University. She has been the poetry editor of Eclectica Magazine since October 2005, and recent publications include Escape Into Life, NEAT, Midwestern Gothic, and YEW Journal, among others. She also has work forthcoming in the Silver Birch Press Alice in Wonderland Anthology. A native New Yorker, James Penha has lived for the past quarter-century in Indonesia. In the photograph, he is opening The Great Gatsby Anthology on his iPad Kindlle app in a jungle near his home on Java. “Jack” (as he is known to his friends) has been nominated for Pushcart Prizes in fiction and in poetry. Snakes and Angels, a collection of his adaptations of classic Indonesian folk tales, won the 2009 Cervena Barva Press fiction chapbook contest; No Bones to Carry, a volume of his poetry, earned the 2007 New Sins Press Editors’ Choice Award. Penha edits The New Verse News, an online journal of current-events poetry. 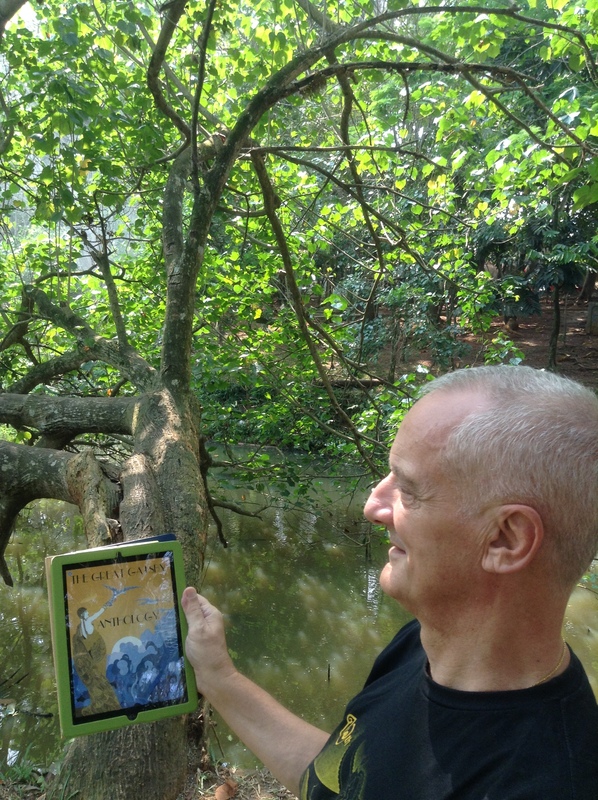 PHOTO: James Penha reading the Kindle version of THE GREAT GATSBY ANTHOLOGY in Tangerang on Java in Indonesia. James contributed his poem “Nick Carraway Out in Three” to the collection. The month of June marks the 4th anniversary of Silver Birch Press — and the 3rd anniversary of our blog. 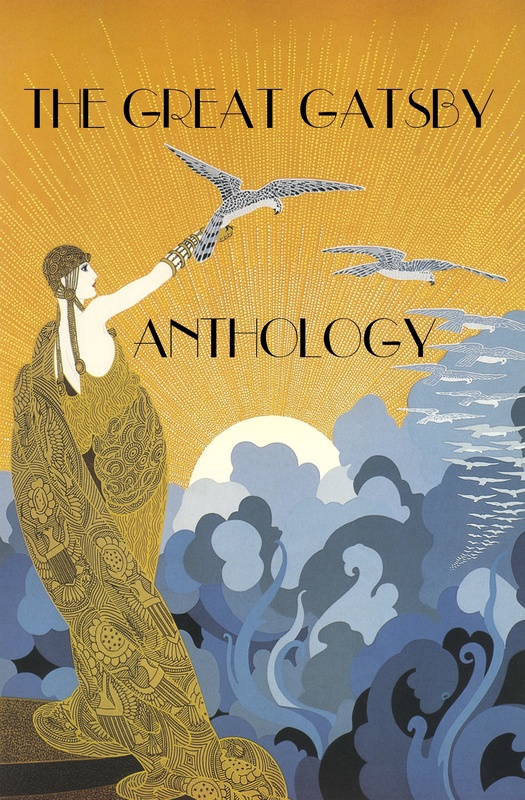 Our first post on June 24, 2012 featured F. Scott Fitzgerald’s novel The Great Gatsby — so it seems fitting to celebrate these milestones with our latest release: The Great Gatsby Anthology, a collection of poetry and prose inspired by The Great Gatsby. This is a unique collection of material that has NOT appeared on our blog. 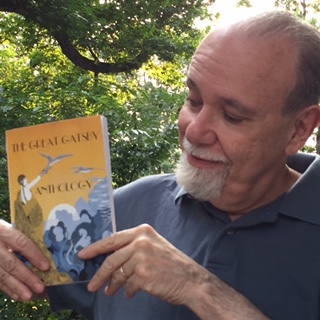 The Great Gatsby Anthology is available in paperback at Amazon.com — with a Kindle version coming soon.